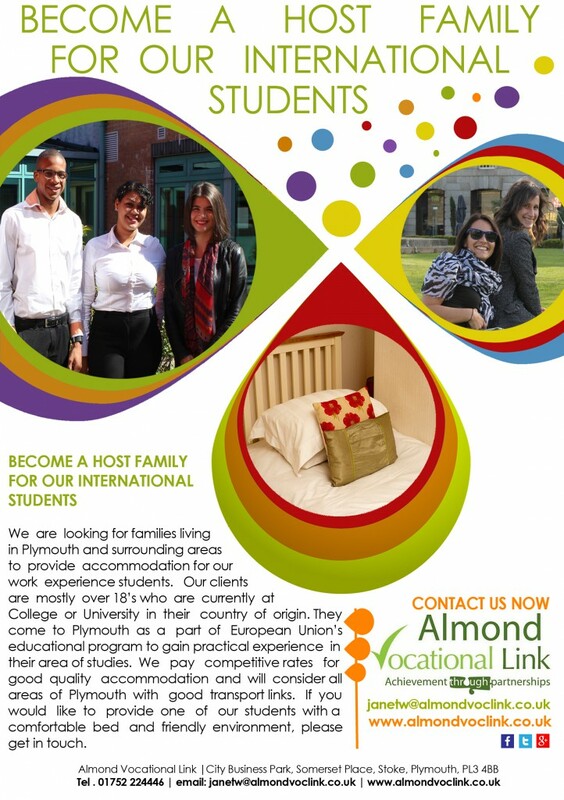 Almond Vocational Link are always looking for families living in Plymouth and surrounding areas who would like to offer accommodation to our International students. Our students are usually 18+ and they stay in Plymouth for period of minimum 2 weeks to undertake unpaid work experience at local companies. We are looking for single and shared bedrooms with a variety of catering options for you to choose from. All areas of Plymouth are considered providing you live nearby a bus route. Fill in Host Family Registration form in which you can tell us a little more about yourself and your household. You will also be able to choose what sort of accommodation you are able to offer i.e. half board, full board, self catering. Arrange a home visit with one of our staff members. We would love to get to know you in person! That’s it. We will contact you, when we have someone suitable. If you are a private landlord currently offering student accommodation and would like us to help you fill your rooms either during academic year or just for the summer, please get in touch.